The people who drive for Uber generally do so because the platform affords them flexibility in when and how often they drive, according to the findings of a study it’s releasing today. 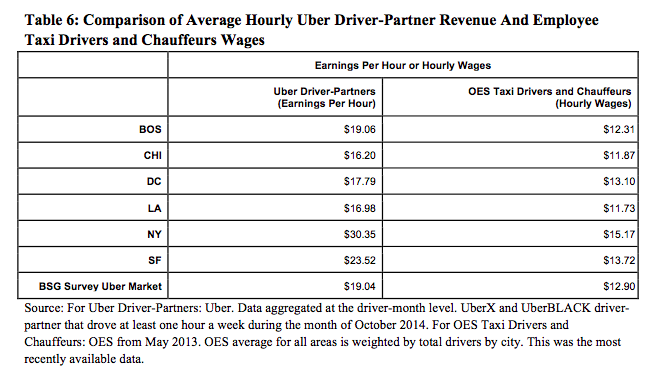 But the platform also offers drivers higher per-hour earnings potential than comparable for-hire driving jobs. 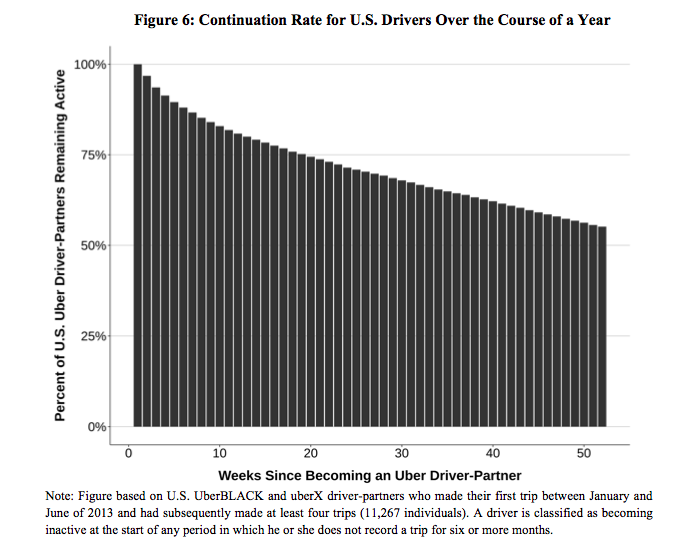 The study, which was put together by Uber in conjunction with Benenson Strategy Group and economist Alan Krueger, seeks to provide more details about the driver-partners on its platform in the U.S. That includes detailed information about driver demographics, earnings, and general reasons that they’ve decided to partner with Uber. According to Uber’s new SVP of Policy & Strategy David Plouffe, the company conducted the study in part to better understand its driver-partners. “We’re becoming a big presence in most American cities and it’s important to learn more about our drivers and who they are,” Plouffe told us during a phone interview. As the company becomes a greater force in the labor market, having data it can share about its drivers is becoming increasingly important. Today, Uber has more than 160,000 partners actively driving on its platform,* and the number that it adds over time continues to grow. The company reports that the number of new drivers it signs up has doubled every six months. Fewer than 1,000 new driver-partners started in January 2013. That number was more than 6,000 a year later in January 2014, more than 19,000 in June 2014, and almost 32,000 in November 2014. In December 2014, with the holiday boost in demand, almost 40,000 new driver-partners provided their first trips in the United States on the Uber platform. While it’s rapidly adding driver-partners, it’s also seeing most of those drivers sticking with it over time. One month after signing up, 11 percent of drivers became inactive. However, after six months about 70 percent are still actively driving for Uber and after a year more than half are still active. Unlike cab drivers, most Uber partners don’t see the platform as a full-time job. Across its 20 largest markets, 80 percent of its partners drove fewer than 35 hours a week, and more than half were working between one and 15 hours each week. That compares to more than 80 percent of cab drivers who logged 35 hours or more based on U.S. Census Data. One reason Uber drivers may work fewer hours is that they’re making more money per hour. In its top 20 markets, Uber partners averaged more than $19 an hour in earnings, compared to $12.90 in average hourly wages for cab drivers based on Occupational Employment Statistics data. Nonetheless, the figures suggest that unless their after-tax costs average more than $6 per hour, the net hourly earnings of Uber’s driver-partners exceed the hourly wage of employed taxi drivers and chauffeurs, on average. The more qualitative part of the study, which is based on a survey of 600 Uber drivers conducted by Benenson Strategy Group, suggests the main reason drivers join Uber is due to the flexibility it affords them to drive on their own schedule. Eighty percent of partners were employed either full- or part-time when they joined Uber, according to the survey, and two-thirds of those were employed full-time right before joining. Only eight percent were fully unemployed when they signed up. While just less than half of Uber drivers in the U.S. had at some point worked as a for-hire driver in their career, 51 percent had never driven for money before. After joining, only 38 percent said they worked for Uber full-time. Another 31 percent said they worked a full-time job and drove for Uber in their spare time, while 30 percent said they held another part-time job. Plouffe said one of the things that’s striking about the study is that over 73 percent of drivers said that if they were given a choice between a 9-5 job and more flexibility and control, they’d choose the latter. Finally, the study had some interesting demographic data that it uses to compare its drivers with those who drive cabs or other for-hire vehicles. For instance, nineteen percent of Uber drivers were below age 30, compared to just nine percent in the taxi industry. Meanwhile, 44 percent of cabbies were age 50 or above, compared to 24.5 percent of Uber drivers. Nearly half of Uber’s partners had a college degree, compared to 18 percent of taxi drivers or chauffeurs. Meanwhile, fewer than 12 percent of Uber drivers had a high-school degree or less, in contrast to more than half of taxi or other for-hire drivers. While fewer than 14 percent of Uber drivers were women, that was still significantly higher than in the taxi segment, where just 8 percent were female. Plouffe pointed out how the diversity of its more closely mirrors the population as a whole. “You see a real cross-section of the population… [and] that speaks to people across the board see this as an opportunity,” he said. * “Active drivers” are defined as those who completed four or more trips per month.